These is a suggested self-drive 14 day tour of this real Australian experience or join one of our tours to have all the planning done for you. Arrive in Walgett, ready for the start of your Outback escape. Take the time to visit one of the main tributaries that flows into the mighty Darling further down the road. Fishing and bird watching spots surround Walgett or visit one of the Artesian Spas to truly start to relax. Walgett is the gateway to Opal Country, so a side trip to Lightning Ridge is a must. This Opal town is the only place in Australia where Black Opal is found. Try your hand at fossicking or visit one of the many attractions that the “Ridge” has to offer. Back on the road and take a scenic route to Brewarrina. Visit the oldest man made structure known in Australia; the Aboriginal “Fish Traps” which are visible today. 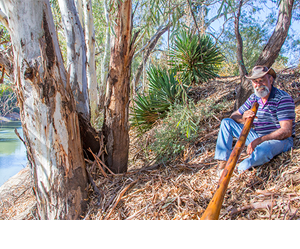 Stop by the Visitors Centre to have a tour guide tell you the stories of yesteryear or view local Aboriginal Art. When the Darling River was used mainly for transport purposes in the late 1800’s Bourke was one of the busiest ports on the Darling. Gundabooka National Park is only a stone’s throw away and don’t forget the Back of Bourke Exhibition Centre, which has only just reopened after a large extension to its exhibits. Commence your run down the Darling to Louth, a tiny town with an amazing horse race event every year that sees the town grow by over 500% for 3 days. Accommodation is available at many of the amazing ‘station stays’ these are an experience on their own, steeped in history with magnificent water views from campsites. Tilpa is famous for its local ‘pub’ The proprietors pass on hundreds of dollars to the Royal Flying Doctor Service which are the result of visitors willing to donate a gold coin to write on the pub walls. The next day takes you to a town that has the most amazing architecture of all of Outback NSW. Wilcannia has some fabulous buildings that date back to the 1880’s when it was a busy shipping port. Drop into Council to pick up your copy of the Historical Trail Guide. Divert off the Darling River Run to visit the capital of Outback NSW, Broken Hill! Be amazed by the city in the middle of the desert that still welcomes newcomers every year to settle in town. Abundant with mining history, art galleries, natural wonders and city style cafes or restaurants. A trip to Broken Hill is not complete without a trip to Silverton and out to Mundi Mundi Plains. Only half an hour out of Broken Hill, the lookout over Mundi Mundi convinces you that you can see for days. Watch the sun sink into the earth on sunset, an awe-inspiring experience. The oasis of the Outback is Menindee and its large lake system. 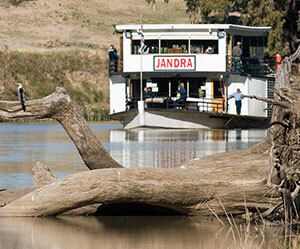 This is where you rejoin the Darling River Run. Marvel at the amount of water that is stored in the middle of desert and how the lakes have regulated the flow of the river downstream to help agriculture. And don’t forget to see where Menindee Seedless Grapes are grown … yes, right here in the Outback! After frolicking in the water at Copi Hollow, Kinchega National Park is the next stop. This magnificent park surrounds the southern end of the lake system and is also the home to much history. The Kinchega Woolshed is regularly photographed as one of the most indicative woolsheds of its time. Choosing which side of the Darling to travel from this point is the hardest decision you will make on the trip. Both sides offer fabulous scenery and things to see and do. Both roads will take you to the quaint town of Pooncarie; a sleepy little town that welcomes all visitors to share in their picnic havens by the Darling. 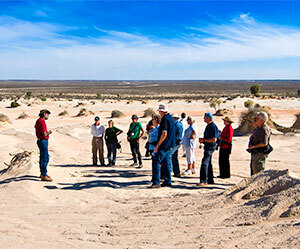 A side trip to Mungo National Park can be included by diverting just after Pooncarie, or if you are travelling East back home, you can include after a trip to Wentworth. Either way, you can’t miss the wonderful scenery created by the sand dunes of Mungo ‘Walls of China’. Make sure you stop by the visitors centre or have a tour of this national treasure to fully appreciate it’s significance and value. Wentworth, where the Darling meets the mighty Murray! Stand at the confluence of the two great rivers and be amazed by the abundant bird life and colours of the water. Only 6 kilometres out of town, Perry Sandhills offers an amazing contrast to the river and great for photography or having a bit of sand fun. 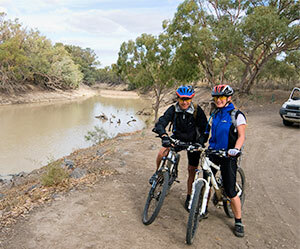 Take the Discover Murray River Trail towards South Australia and the end of the Murray River or head east towards Echuca and Albury for the complete outback river’s experience!